inCASA will create citizen-centric technologies and a services network to help and protect frail elderly people, prolonging the time they can live well in their own home. This goal will be achieved by integrating solutions/services for health/environment monitoring to collect and analyze data in order to profile user behaviour, implement customized intelligent multilevel alerts/communication services. Data will be made available to care services through a Smart Personal Platform with an embedded Behaviour Analysis Application which will include: access policies to preserve privacy; planning for day-by-day activities and therapies with multiple alerts; co-ordination of local public Social and Health Care Services; and help to deploy specialist community based services. inCASA further investigates the issues of designing ideal specialist services to support activities that are community based – one type will not fit all. By considering the European and different health sector dimensions, it will identify common service delivery paradigms (business models), but can explore how these are delivered in the scenarios to determine optimum clinical models. 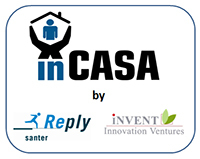 Target users of inCASA project are (for Pilots) European citizens, over 65 years old, living at home alone and with a sufficient level of autonomy and self-care ability. They may have a need to improve self-confidence and ability to cope with day-to-day life, in order to and increase independence and prolong the time they stay in their own home.The final Commercial solution will focus on various fields, for example chronic disease. People at home will live their lives as usual, but Home Sensor Networks and Human Monitoring Sensors (HMS) will monitor their lifestyle and will interact, if needed, with the citizen themselves or with the Service Provider. A business model based on a public-private partnership – to adopt an ontological perspective on exploration of innovative service concepts and value creation based on the analysis of economic value creation and exchange of value objects between stakeholders. Primary end-users: improved quality of living and health, mobility, staying longer in the workforce, etc. Secondary end-users: improve case management, effectiveness, better resource utilisation, etc. inCASA will provide useful tools for professional users; e.g. elderly people‟s profiles could be used by healthcare professionals to set therapies and to plan social and therapeutic activities.